When I was a kid, I sometimes watched The Cosby Show with my parents. While I thought it was funny, I remember also thinking that "funny" was all it was. There was no seriousness, no real conflict, no drama, no problem to be solved. The only thing that really changed throughout the series was that the kids got older. It was just a funny American family, living their normal, upper-class, American lives. Even though I was only about ten at time, I hungered for drama, suspense, adventure, and conflict. Even then, I recognized that my favorite books, TV shows, and movies had strong conflicts at their center. The Lake Effect does have several positives, but sadly, a strongly-developed conflict with suspense and tension is not one of them. SUMMARY: Eighteen-year old Briggs Henry has a plan: work hard, be successful, make lots of money. Briggs is positive nothing can derail him from a future of wealth, success, and happiness. Newly-graduated from high school, Briggs will spend the summer before college as a house helper for a wealthy elderly lady, Mrs. B. Along the way, he plays beach volleyball, meets a mysterious girl next door, attends funerals, and makes some decisions about his relationship with his parents and his grandmother. REVIEW: Every year at Christmas, I always read at least one Christmas book. And every year during Spring Break, I read "beachy" summer romances. 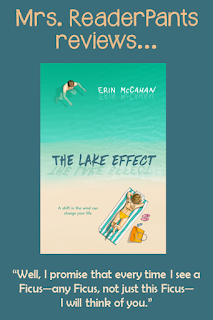 It is now Spring Break, and The Lake Effect was this week's selected beachy book. I'm glad that I finished it, but that didn't happen easily. My main complaint is that the book was super-boring, and I only finished it by requiring myself to read 5% at a time. I alternated my required 5% with other books that I was more interested in. I read the last 20% all at once, and that is where most of my "What I Liked" came from. If you are reading this book and consider abandoning it, know that it does eventually get interesting near the end. WHAT I LIKED: I loved the quirky Mrs. B! Mrs. B is the 84-year old Serbian woman that Briggs lives with for the summer. His job is to help Mrs. B with whatever she needs help with: housework, home repairs, driving, running errands, companionship. She also requires Briggs to go to a lot of funerals and paint the inside of her house in all these different shades of blue. Author Erin McCahon did a great job writing Mrs. B's Serbian accent into her dialogue. She mixes up her English words frequently in a really cute way, and I just loved her to pieces. I also loved Briggs's grandmother, Grandma Ruth. Now there's a sourpuss that I would really get along with. Her little verbal digs at Briggs's (tool of a) father were awesome and made me chuckle. I also loved the Lake Michigan beach town environment. I have been to a beach on Lake Michigan (in Chicago), and I remember that water being super-cold, even in July! I love the Great Lakes as a book setting because they have this creepy allure for me. It's like, there could be anything in these huge lakes. They are lakes, but maybe they would be more accurately described as landlocked seas. It's a unique setting for a summer beach romance. I liked the inclusion of Abigail's disease (not going to spoil it though as it's a mystery revealed in the second half). I know someone living with this condition, and it's not talked about enough. To be honest, most of what I know about it came from this book. As much as I struggled to stay awake while reading, the last paragraph made me smile. I would say it helped redeem the entire book for me, bumping the book from two-stars to three-stars. As in gymnastics, book endings are hard to stick. Erin McCahon sticks this ending with gusto. Nicely done! WHAT I DIDN'T LIKE: As I said, it was super-boring. It's like The Cosby Show in that it's (sorta) funny, but nothing much changes or happens until almost the very end. And when things finally start happening, they were glossed over too quickly to have any real emotional impact on me. It's a shame because one of the things that happens had the potential to make me cry, but the scenes were too fast and the writing not quite there. I also didn't care much for Briggs. What a Gary Stu! He was Mr. Fake Perfect who never made a mistake and was always so damn understanding and friendly with his special smiles and sweet to the elderly ladies. Where are his character flaws? Where is his downfall? Sure, he says something rude to a bubbly beach girl, but he apologizes for it, over and over, until she forgives him. And even that isn't so terrible because he said it out of frustration. Realizing he said one rude thing and apologizing for it does not equal a complex character arc. The romance had no sizzle. Abigail is just as boring as Briggs. I'm sure they'll grow up and have 2.5 boring babies and live in a boring house on a boring street and work in boring jobs. What's with all the references to farting? I get that a boy is narrating the story, but come on. THE BOTTOM LINE: This is a relatively clean, uneventful, summer beach romance. The elderly characters, the Lake Michigan setting, the humor, and the sweet ending really help redeem an otherwise dull story. STATUS IN MY LIBRARY: I plan to booktalk this in my library next week to see how my students react. Usually, when I think a book is just okay, I put it to the students to tell me if I should order it for the library. If someone requests it, I'm happy to order it for them.